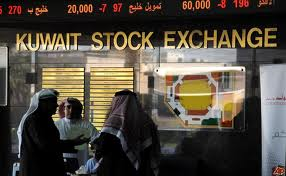 Kuwait Stock Exchange (KSE) kept to red throughout trading on Tuesday and the day ended with the price index losing 9.69 points to reach 8,122.6 points, the weighted index shedding 1.12 points to reach 462. 33 points, and the KSX 15 also losing 5.59 points to reach 1,063.89 points. Trades came to 4,350 transactions worth KD 21,1 million with volume at 195, 186,137 shares. Top gainers were (NOOR), (MENA), (GFC), (HCC), and (SAFWAN). The top volume stocks were (ADNC), (GFH), (NOOR), (MAYADEEN), and (GIH).